Ascott Analytical Equipment adds to its recent award success with further recognition from the Department for International Trade. After winning the Made in the Midlands Export Award and Midlands Region Export Award from the EEF (The Manufacturers Organisation) in 2017, Tamworth-based Ascott Analytical Equipment has started 2018 by beating other Regional winners to win the National Award for Export from the EEF. 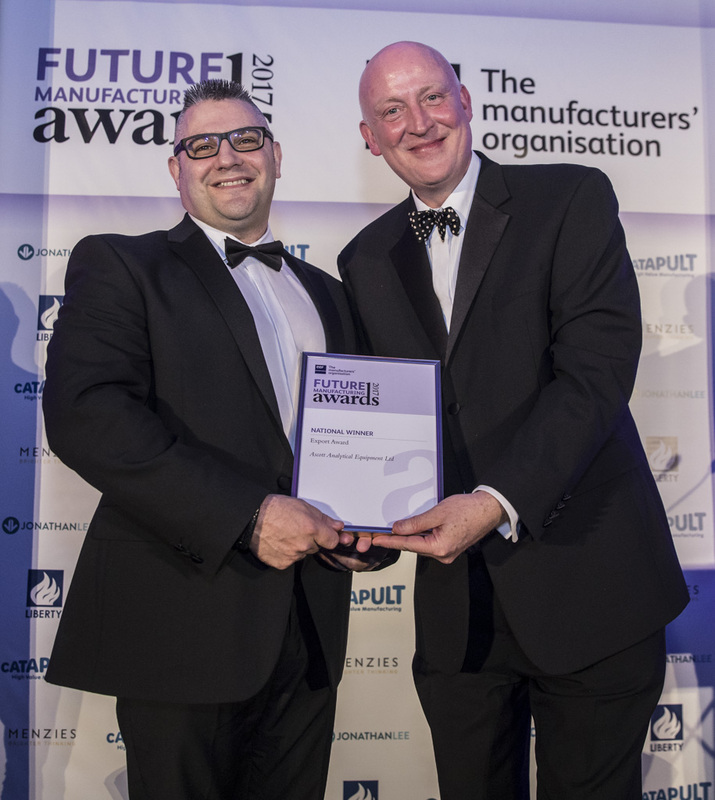 The Award was presented to Adrian Wain, Manging Director of Ascott Analytical by the Department for International Trade at the EEF National Gala, held at the Grand Connaught Room in London, on 25th January. Established almost 30 years ago, the company manufacturers test equipment, used by manufacturers in the automotive, aerospace and coatings industries to determine corrosion resistance of manufactured components. The company won the award for successfully developing over 90% of revenue from markets outside the UK, with over half of this being generated from developing Asian markets. To establish a Global profile enabling sales to almost 100 countries on an annual basis, the company has created marketing material in 21 different languages to support almost 60 distributors and agents based right across the Globe. Ascott can claim some of the best known names in industry amongst its customer base including; Tesla, Daimler Benz, Bentley, Volkswagen, Bosch, Boeing, Airbus, AkzoNobel, PPG, Samsung, Panasonic and Hitachi. Chris Gates, Chairman of Ascott says “We’re very proud to win our third award in the last year. A National Award in addition to our two Regional Awards means a lot to everyone in the company. In addition to the tremendous growth we’re seeing in the business, this is further recognition that we’re on the right track along with other successful British exporters, and that the strategies we’ve implemented over recent years are now paying dividends”.